WLS qFlash - CMM Inc. The WLS qFLASH is a sophisticated white light system that accomplishes 3D measurements and is able to analyze and generate reports at the source. The qFLASH can be held by a person or mounted on a stand for maximum flexibility. 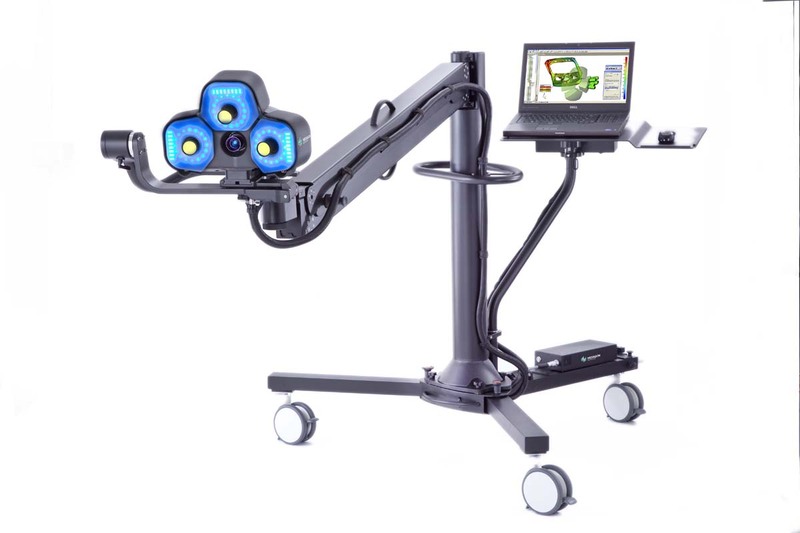 A non-contact multi-talent and stereo vision system, Hexagon Metrology’s WLS qFlash offers a mobile experience like no other. This sophisticated white light system accomplishes 3D measurements on the shop floor. It’s fully enabled to analyze and generate reports right on the spot by being held by a person or mounted on a stand for maximum flexibility. Lightweight and easy to maneuver, this unique piece of technology is also robust, allowing you to perform a job with ease and peace-of-mind. Designed to be used on a tri-pod or in handheld mode, this tool can be used in a wide variety of applications, including: sheet metal measurement, inspection of closures, aluminum and metal casting measurement and inspection of plastic parts. You can rest easy knowing that this affordable solution can get the job done right, the first time. Offering a one-of-a-kind design, the qFlash’s optical head design is small, light, and easy-to-handle in limited or confined industrial spaces. As a result, this is a popular tool among automotive and aerospace suppliers, plastic part and electronic manufacturers, and OEMs. - Report and digitize acquired data on the spot for analysis or direct CAD comparison. You can also enjoy reverse engineering image acquisition capabilities, using the built-in sensor for fast dimensional measurement. - Reliable and fast results, every single time. The WLS qFLASH is wrapped in a high quality carbon fiber optical housing, and uses advanced blue LED high power illumination. You will also enjoy speedy image acquisition at an average of 10 milliseconds, which deliver constant measurement workflow. - Enjoy high throughput, thanks to the system’s rapid image acquisition, which utilizes patented stereo vision technology and 2D image processing. This will allow you to measure closed features and edge lines. - Easily measure a wide variety of surfaces. Whether you’re working with a low sensitivity to machinery vibration, industrial light or temperature changes, qFLASH can be used in a wide variety of shop-floor environments.